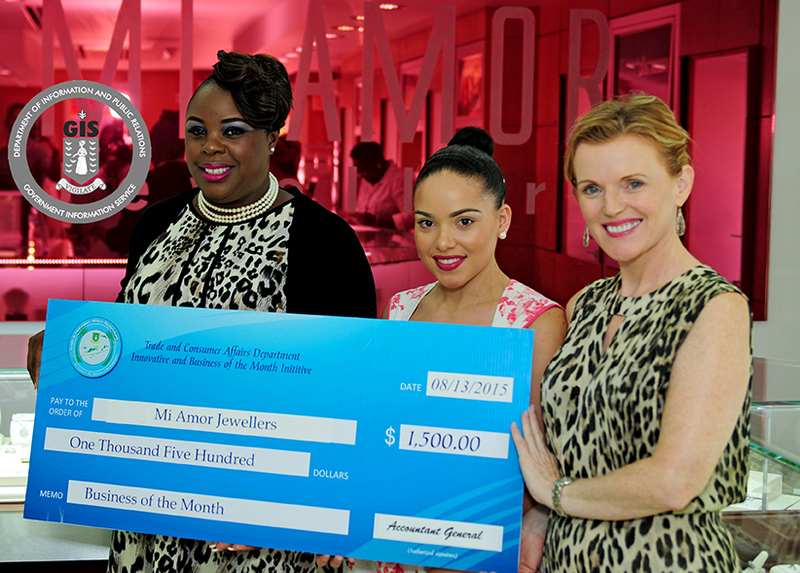 Mi Amor Jewellers has been named August Business of the Month as the Department of Trade and Consumer Affairs continues its efforts to promote and assist small businesses in the Territory. Mi Amor Jewellers captured the award which has as its criteria, outstanding customer service, provision of unique products, and diligent community involvement. Mi Amor Jewellers opened its doors to respond to the overwhelming need for affordable jewelry and watches in the local market following the closure of Colombian Emeralds International. Its style is categorised as a European boutique jewelry store meets modern retro Caribbean flavour. The business offers their customers exclusive and unique jewelry, as well as the option to redesign or alter jewelry. Mi Amor specialises in certified loose diamonds, Zambian and Colombian emeralds, sapphires, rubies, gent’s jewelry and gold fashion jewelry. Simultaneously, the boutique has sought to differentiate its products from other jewelers. As part of its winnings, the business will receive monetary funds to promote the business and further promotion by way of Government through the provision of free advertisements, which include a GIS interview with the business owners; sponsored commercials for the month via radio and television; a business profile on the Government’s website and the online media; a profile on the BVI Chamber of Commerce and Hotel Association’s website; one year’s free membership with BVICCHA; and a framed certificate. For more information about Mi Amor Jewellers visit their website at www.miamorjewellers.com. Alternatively they may be contacted at telephone at (284) 494-7477 or (284) 494-7478. The Department of Trade and Consumer Affairs continues to support small businesses and encourages businesses in the Virgin Islands to supply quality products, provide excellent customer service, and give back to the community to have a chance at becoming the next Business of the Month. Nomination forms are available on the website www.bvi.gov.vg. Businesses can apply, or members of the public can nominate businesses or business persons by submitting a nomination form and an essay of at least 300 words stating why the nominee should be considered for the Business of the Month award.